I found this to be a very disappointing read. There is so much potential here and yet I wasn't at any point excited about reading this, dying to keep reading, or even all that inspired to pick it up. After thinking on this for a day I think I've identified why. The world building is spectacular in this book with a magical system that is intricate and well thought-out. However, the reality is that world building is not enough. Even with moderately interesting characters like Prince Kance and Kalen I still just didn't care enough about anyone to be concerned about their safety or destiny. Rin Chupeco gets too caught up in indulging herself and info dumping about her world. This is not the Silmarillion. I don't need, or even want, to read every detail of every ingredient in a tincture, step in a dance, or history lesson or story that isn't even relevant to the current politics! Or if you're going to write out a fable or story within the realm then make that story really, really good. There are two amazing examples of this being done well in fantasy literature: Suzanna Clarke's Jonathan Strange &amp; Mr Norrell (with crazy story footnotes) or Juliet Marillier's Daughter of the Forest. These books incorporate the lore and history of their worlds so well that you almost care more about the mini stories told than the larger story! Additionally there is little to no actual chemistry between anyone in this book. Be it a friend, mentor, teacher, or possible love interest. Our lead gal, Tea, doesn't seem to connect with anyone, not even her own brother that she says many times she loves and yet I never really felt it. The format of the book is interesting and I did enjoy the snippets of Tea 'today' in the quick page or two break-ups to the main story of Tea as a novice asha. And yet, by the end of the book we have learned NOTHING more to really connect the Tea we get to know as a novice and the Tea in her 'current state'. Additionally the ending is soooo disappointing. There is clearly a HUGE chunk of the story left out. Which would be fine if at least the story I had written to that point had some sort of plot or intrigue. Even the so-called love interests (if you can even call them that) are dull and Tea has almost no actual ability to connect with them. It's really odd because all the right elements seem to be in this book but it's just not compelling. I just can't get excited about any of it and ultimately I became bored and looking forward to the next book I was going to read. I almost DNF'd this one. However, all that said, and even in spite of my boredom, there is a spark of interest at the end of the book. This tiny spark means I would actually consider trying to read book 2. Because I think there is potential here. In the meantime really hope someone is mentoring Chupeco on how to write more compelling characters and stories. Plot is important, please give me some! And let's face it, this is a young adult book, if you are going to have love interests then don't just make them a passing blip on the radar. Let's get them involved a bit more! I appreciate that there is no insta-love and the eluded to love triangle didn't seem to happen (though still could in future books); and yet I just wanted something more. I believe this book, in the hands of a different writer could be sensational. But Chupeco is missing that 'something' that gives writers like Mass and Meyer an edge over other young adult writers. I hope she can find it before book 2 is released. Please note: I received an eARC of this book from the publisher via NetGalley. This is an honest and unbiased review. Tea is a Bone Witch! Darkness emerges as Tea's brother Fox is killed while on patrols. So full of grief over her brother; Tea's powers of necromancy reveal themselves. Together the newly raised Fox and his sister embark to hone her skills and find her place. Chupeco has created a world full of desciption but very little action takes place. An arc was supplied by the publisher via netgalley for an hones review. 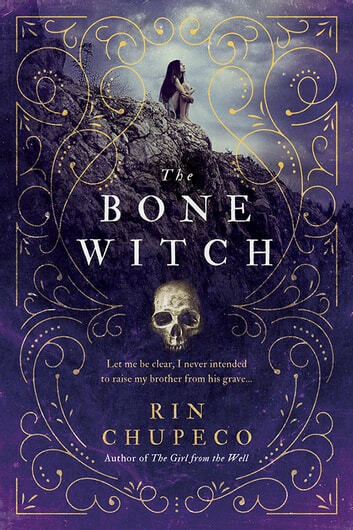 Excellent read of a young bone witch, too good to put down.